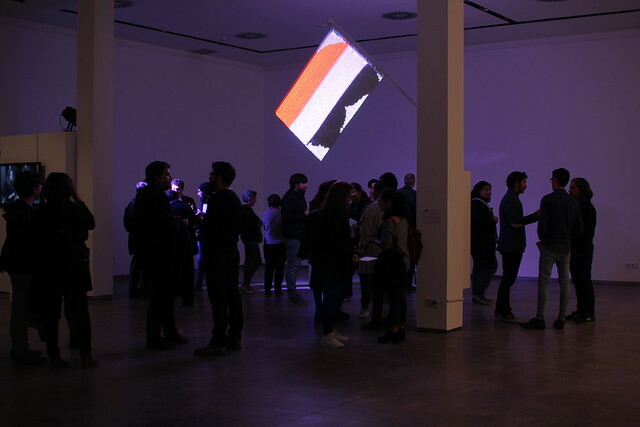 Chameleon is a white flag made of a fabric with embedded LEDs that allow it to become the flag of any country. 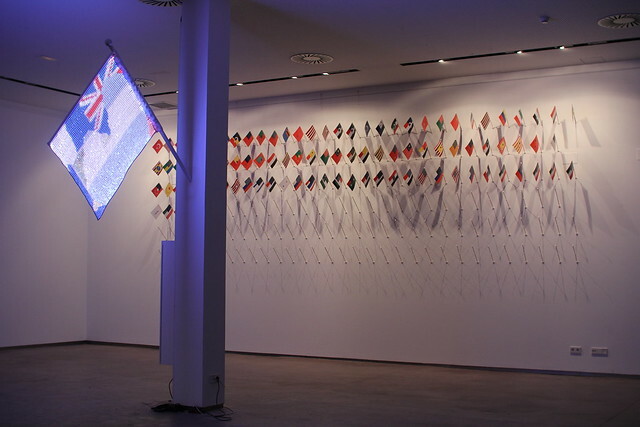 Attached to the wall by a flagpole and a rod that keeps it spread out, the piece reacts to the people’s presence by showing in a compulsive way the flags of different countries, chosen at random from a database. The design of each flag is never completed, but mutates constantly from one nation to another, blending colours and shapes in such way that it becomes an amalgam of all flags and none of them at once. Like a scared animal who tries to adapt to its environment, the flag is immersed in a never-ending process that reminds one of the critique of cosmopolitanism by Barber: trying to represent all the nations on the planet, it ends up becoming a foreign or even alien flag. Observed from the expectation of a final shape, from the strong statement that a national flag represents, this modest cloth seems doomed to failure, since its design will never be completed. Therefore, it can be interpreted in terms of those opposing cosmopolitanism, as some- thing merely illusory and devoid of substance. Nevertheless, if it is looked at as a living process, the flag tells us about a continuous exchange in which the different countries meet and blend without hierarchies. In this way, it echoes Nussbaum’s proposal and the conciliating view of Wallerstein, who reminds us that we are living in an unequal world, subjected to constant changes. (text by Pau Waelder from exhibition catalogue ”Camaleon”, 2015: 18). The inspiration for the artwork came from our multi-cultural backgrounds. The aim is to communicate the problematic of national identity, belonging, and tolerance in the cosmopolitan times, and at the same time, rising and extremely polarised nationalism. We use light for two reasons: first, for being able to mutate one flag to another. And second, for affecting entire space. It means, not only the Camaleon takes the colors of the flag but entire space changes together with the artwork.